Dubai, January 17, 2019: Dubai-based international athlete Sarra Lajnef has added to her impressive list of accolades the Women Leadership Award from the World Women Leadership Congress for her outstanding personal achievements and resolute determination in pursuit of sporting excellence. 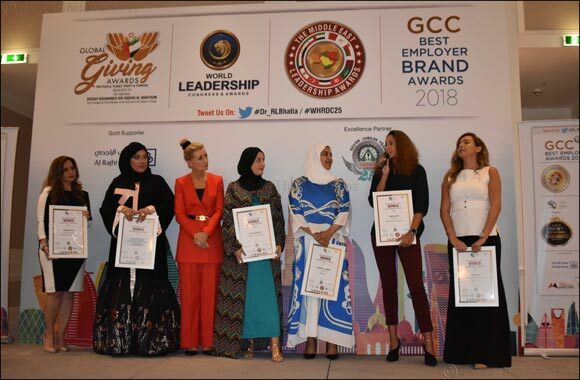 Sarra's inspirational accomplishments came to the attention of the Middle East Women Leadership Awards committee after an extensive research process, which resulted in a shortlist of individuals who ‘are doing extraordinary things'. Shortlisted names were then put forward to a jury of senior leaders, researchers and academicians who judged the contenders based on a range of criteria, including their ability to influence and empower. Sarra, who first demonstrated her sporting prowess while studying at the University of Wollongong in Dubai (UOWD), became the first woman swimmer to represent Tunisia at the London Olympics in 2012. She then switched tracks to competitive rowing and now has her sights set on the rowing event at the Tokyo 2020 Olympics. In October 2018, Sarra competed with great success in multiple sports events, including Abu Dhabi Open Aquathlon, the Ignite Pink is Punk Swim Run, Abu Dhabi Swimming Festival and the Sheikha Hind Woman Games. She took 6 first places, 2 second places and 1 third place in the various running and swimming events. She also took part in the 2XU Super Sport Triathlon – her first-ever triathlon – finishing as the first female in the Super Sprint event and second in the competition overall. Currently, Sarra she is training for the 2020 Olympics – triathlon. She will also be competing in the Master World Championship this August in South Korea (swimming). The Women Leadership Awards are celebrated in several geographic regions as a build-up to the World Women Leadership Congress. Entering its 9th year, the event celebrates some of the finest woman leaders and achievers and endorses the Women Leadership Awards, along with CMO Asia (GCC Edition). The award certification is provided by the World Women Leadership Congress.